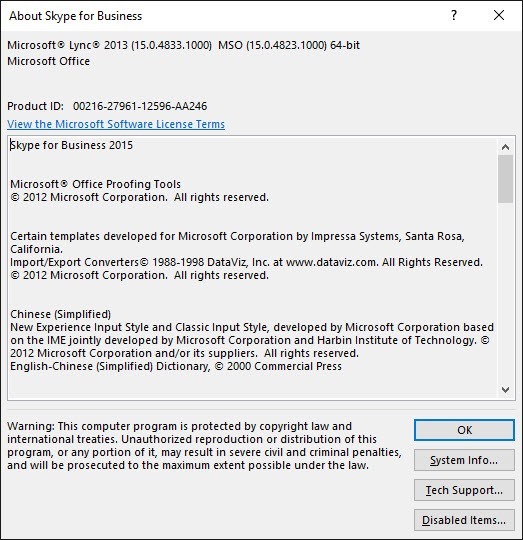 This week’s bumper update takes the Office 2013-based Lync/SfB client from 15.0.4809.1000 to 15.0.4833.1000. A few people have found their recent updates haven’t delivered as expected. Don’t forget *all* of the pre-req’s. The Office 2013 SP1 requirement still applies if you’re using Outlook 2010, as Lync 2013 in all of its flavours – e.g. Lync Basic – is still a component of Office 2013. I have all the pre-req’s already installed, so a reboot was not required. 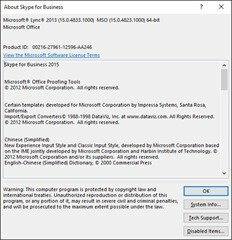 I was however running Outlook 2013 at the time and I was prompted to exit it, to which I duly complied.